On thanksgiving BabyLiu asked to knit. She can’t, mind you, and she generally doesn’t want me to help her. She just likes playing with yarn. So I gave her a ball of yarn and some needles and she went to town. I think about her request for a minute. A house is basically a square, right? I can probably do this. So I agreed. 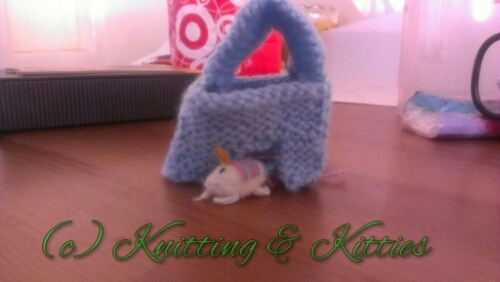 She handed me the yarn and needles I had given her and I cast on. BabyLiu then proceeded to spend the rest of the project critiquing the pattern I was making up on the fly. So I add a door. 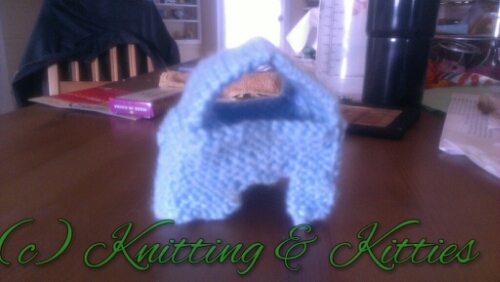 So I knit a roof. The roof was the most difficult piece. I frogged it a couple of times before I got a fit I was happy with that I could make with the remaining yarn. So I set it on the table and said that was the floor. Problem solved. 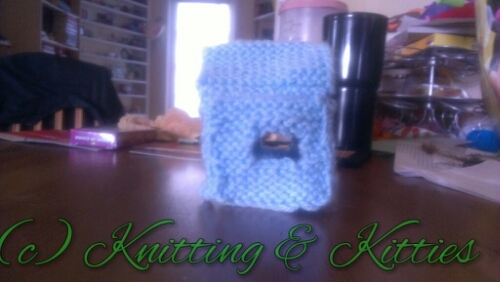 Here is the little knit house with its door. And roof. If I had more yarn, time and interest I would have filled in the triangles on the roof. The current inhabitant doesn’t seem to mind, though.